Is My State in Crosscheck? Idaho first participated in Crosscheck in 2014. 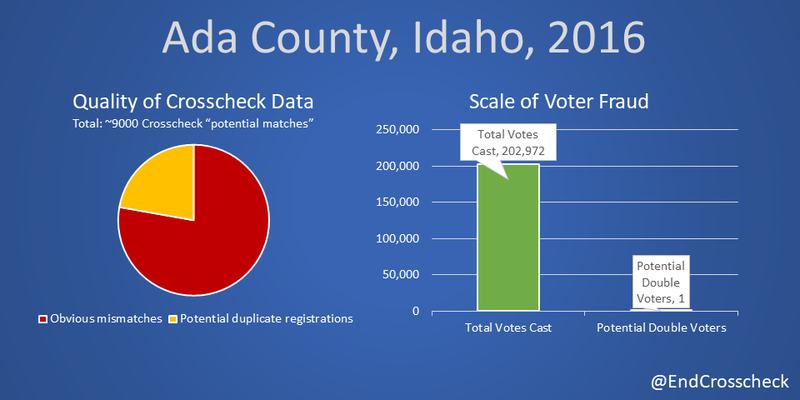 Idaho's roll-out of Crosscheck was notable in that incorrect instructions regarding how to handle Crosscheck matches, leading to the erroneous purge of over 750 legitimate voters in Ada County. Idaho's response to Indivisible Chicago's open records requests provided all of their file encryption passwords and FTP server credentials, along with the secret IP address of the central Arkansas FTP server which holds 100 million voter records each year, leading to this story in Gizmodo. We obtained and mapped Idaho's 2017 Crosscheck results. Each pin between in this map and this map (we exceeded the Google limit) represents an Idahoan who was identified as potentially matching a registered voter in another state. To understand the poor quality of this data, the Idaho Statesman obtained some Crosscheck statistics for Ada County, charted below. Secretary of State Lawerence Denney has the power to unilaterally decide to withdraw from the voluntary Crosscheck program. State Senate Minority Leader Michelle Stennett and House Minority Leader Mat Erpelding have both stated they are exploring legislation to force the state to leave the program. Call Secretary Denney to urge him to leave the insecure, flawed Crosscheck program. Your data privacy is at risk. Then call or write your state legislators with the same request and to ask them to work with Senator Stennett and Representative Erpelding to withdraw from Crosscheck. Remind them that if they truly take voter roll maintenance seriously, they should instead join the ERIC program. The Idaho Statesman's Cynthia Sewell has provided phenomenal coverage of this issue. EndCrosscheck.com is an Indivisible Chicago project.